"We are thrilled to have German Bundesliga Team Mainz 05 play in this exciting tournament and offer training camps to local youth" -- Des Hague, Co-Founder of Hague Enterprises, Chairman of the Board and CEO of Froozer® and Partner of WC&P. Local prominent business leader and philanthropist, Des Hague, has teamed up with Justin J. Rose, Owner of Germany's JJR Consulting GmbH and Founder of FUNDING ONE'S FREEDOM to bring Colorado Cup 2016 - Fueled by Froozer® - to Colorado Springs on July 13. "We are thrilled to have German Bundesliga Team Mainz 05 play in this exciting tournament and offer training camps to local youth," stated Hague, Co-Founder of Hague Enterprises, Chairman of the Board and CEO of Froozer® and Partner of WC&P, all local CO/Denver-based businesses. Festivities including a 'Celebration of Soccer Week' July 11-15 will be part of the international soccer event. 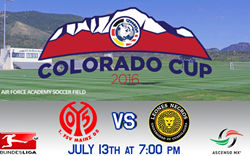 Throughout the 'Celebration of Soccer Week' there will be youth soccer camps at Air Force Academy in Colorado Springs and Vail, a Youth All Star Girls Game followed by Mainz 05 vs. Switchbacks at Switchbacks Stadium in Colorado Springs, CO, on July 12, and a Youth All Star Boys Game followed by the Mainz 05 vs. Leones Negros Colorado Cup game at Air Force Academy in Colorado Springs, CO on July 13. For more information and to purchase tickets, click here. "I am especially pleased that we will be able to raise money through this tournament to support at-risk and underserved youth in our community," concluded Hague. Froozer®, a frozen snack bar brand based out of Denver, CO has committed to providing samples during clinics for the kids, sponsor kids in need to participate in pro-run clinics, and make available event tickets for folks who would like to participate but may not have the means. "We're looking for sponsors to come on board and help us help these kids realize their dreams," said Hague. Those businesses and individuals looking to help can sponsor a child for $400 to partake in this amazing opportunity of being trained by Mainz 05's professional coaches. For more information on how to get involved, please visit http://www.coloradocup2016.com. “It's a very special feeling bringing international soccer and our "Celebration of Soccer Week" to Colorado... a place where I was born and raised," said Rose before continuing "giving back to Colorado Soccer which did so much for myself and many others growing up is a dream come true! The idea of the Colorado Cup 2016 promoting this beautiful state around the world as a soccer state as well as a great place to live and visit is very rewarding,” concluded Rose. FUNDING ONE’S FREEDOM is a for profit, social enterprise which partners with businesses and people to raise funds needed to inspire the youth by instilling F.R.E.E.D.O.M. from within. Proceeds from events like the Colorado Cup 2016 go towards FUNDING ONE’S FREEDOM. The Colorado Cup 2016 will provide money to various soccer associations and clubs for their development and help sponsor youth soccer camps and international exchange programs. FUNDING ONE’S FREEDOM has helped foreign exchange students, youth soccer teams and individual soccer players and will continue to provide future funding for children and people striving for F.R.E.E.D.O.M. (Fitness, Responsibility, Education, Experience, Determination, Opportunity and Mindset). (http://www.fundingonesfreedom.com/). A renowned executive with over twenty-five years of leading global public and private companies, Hague has established himself as an innovative thinker in the international business world. His forward-thinking approach pushes companies toward sustainable growth, granting them a position as resilient competitors within their respective industries. His past positions include President of Safeway Inc., President of IHOP, President of Hot Stuff Foods LLC, Vice President of 7-Eleven Inc. and, most recently, President/CEO of CenterPlate Inc., the largest event hospitality company in North America. Hague is also the Co-Founder of Hague Enterprises, a Colorado-based advisory and investment company, focused in multiple sectors. In addition, Hague serves on the boards of DVETelepresence, PING HD, WC&P, Lessons For Life, World of Beer, Halls Cheese, Serenity Spa and Salon and the Stamford Youth Foundation along with advising on several start-up ventures. Along with his professional projects, Hague contributes significant amount of time and energy to non-profit charitable work. Hague has helped raise more than $100 million over the past few years for many non-profits, including the Stamford Youth Foundation, a local organization offering multiple after-school programs for young people, and The Journey Home, a Baltimore-based Foundation fighting homelessness. Hague views Aegis Enterprises, LLC as a perfect blending of business and philanthropic activities.